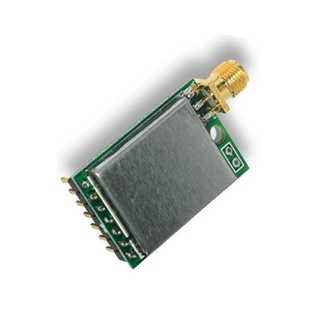 WT-900M is a highly integrated low-power half-'duplex RF transceiver module embedding high-speed low-power MCU and high-performance RF chip with LORA modem which is capable of achieving significant longer range than existing RF transceiver based on FSK or OOK modulation.WT-900M module provides multiple channel choices, then users could modify the serial port rate, transmission power, radio frequency and other parameters online. This module uses LoRa modem to improve the sensitivity up to -144.1dBm, significantly extending the transmission distance under a low power. So there is no need for repeater and complex communication infrastructure. Due to the transmission distance increases, users could significantly reduce the usage of repeater, simplify the system design and reduce the production cost. WT-900M module’s supplies the voltage 2.6-3.6 V with consuming only 15 mA at the receiving mode.WT-900M module has four work modes and each one could be switched free. Under the power saving mode, the module consumption is only 1.13uA. The lithium battery with 3.6 V / 3.6 AH could work for several years, which is very suitable for a battery-powered system.